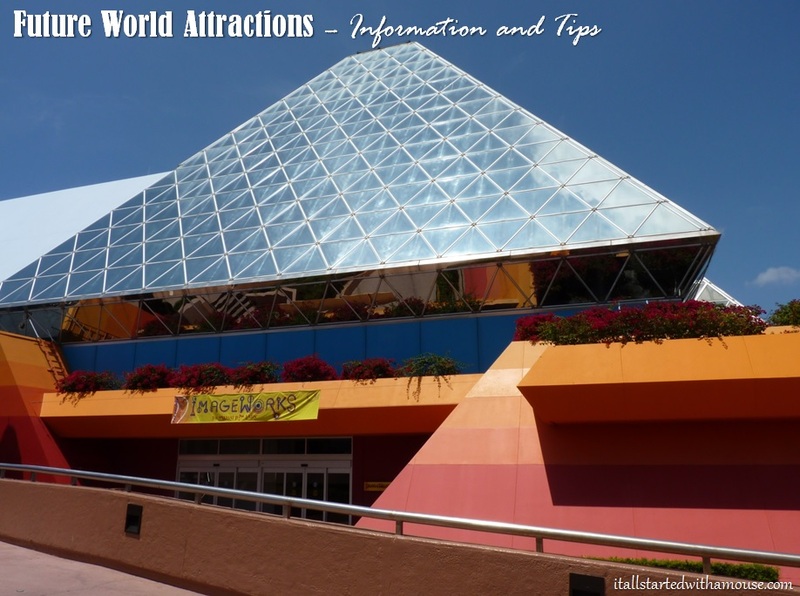 Below is a quick overview of each attraction in Future World at Epcot. Fun show featuring Timon, Pumba, and Simba reminding us to protect our fragile environment. 3D animated show that features the Disney and Pixar shorts: Get a Horse, For the Birds, and La Luna. Allow about 30 minutes for each Innoventions East. Character wait times at Innoventions West can be long – expect between 30 – 90 minutes, depending on the time of year. Innoventions East features Colortopia, an exhibit that allows you to hands-on exploration of the world of color. Innoventions West is currently a character meet-and-greet location that features Baymax on one side and Joy and Sadness on the other. Note: FastPass+ are not available for the character meet-and-greets at Innoventions West, so plan to get there early, or else be prepared to wait in line! Figment is a classic and this ride used to be pretty cool. However, I feel like this ride is tired and lacking a little since they “renovated” it in the late 90’s. Still worth a visit, probably not a FastPass though. This is my favorite ride at Epcot. You now think I’m crazy but here’s why: it’s always a walk-on; it’s a long boat ride through air conditioning, so you can sit and relax; they have beautiful tropical plants, vegetables, and trees that they are growing in unique ways; there are baby alligators. I rest my case. Experience blasting off into space and landing on Mars. NASA provided Disney with images from the surface of Mars, so this experience is probably as close as we will actually come to orbiting the Red Planet. Tip: Those who experience motion sickness need not apply. Climb aboard your Clamobile and journey into the depths of the ocean to help Marlin find his son. The special effects at the end are pretty fun! Tip: Set aside some time to explore the aquarium! They have manatees, sting rays, sharks, and turtles. Plus they sometimes have short dolphin demonstrations! Recently revamped, the pre-show area now features the ability to customize your own vehicle and take it for a test spin on the course. Test Track is the fastest ride at Disney World, topping out at 65 mph. Innovative technology allows children to actually talk to their favorite turtle friend, Crush. The show is very fun, especially for younger kids who might even have the chance to ask Crush a question. Later dudes! This long ride is another great way to relax while at Epcot. It takes you on a journey through the centuries, locating different natural energy sources. The ride is a bit dated (Ellen, Bill Nye, Alex Trebek, and Jamie Lee Curtis look so much younger!) but still a great way to get off your feet and even learn something!